ORLANDO, Fla., Aug. 9, 2017 /PRNewswire/ -- Florida's housing market continued its positive momentum in the second quarter of 2017 with more closed sales, higher median prices and more pending sales, according to the latest housing data released by Florida Realtors®. Closed sales of single-family homes statewide totaled 79,888 in 2Q 2017, up 3.7 percent over the 2Q 2016 figure. "Florida's economy and jobs outlook continued to grow in the second quarter of this year," said 2017 Florida Realtors® President Maria Wells, broker-owner with Lifestyle Realty Group in Stuart. "State officials just reported that among all states, Florida had the third-fastest annual private-sector job growth rate in the nation. Meanwhile, the state's unemployment rate was 4.1 percent in June, better than the U.S. unemployment rate of 4.4 percent, according to the Bureau of Labor Statistics. Demonstrating that Florida is more than a destination state, these positive economic factors drive Florida's housing market forward. Pending sales for single-family homes over the three-month period rose 1.4 percent year-over-year, while condo-townhouse pending sales rose 2.7 percent. "However, a shortage of for-sale homes continues to hamper sales, as buyer demand outweighs available inventory in many local markets. Working with a Realtor in their area enables consumers to better understand local market conditions and navigate the complexities of buying or selling a home." 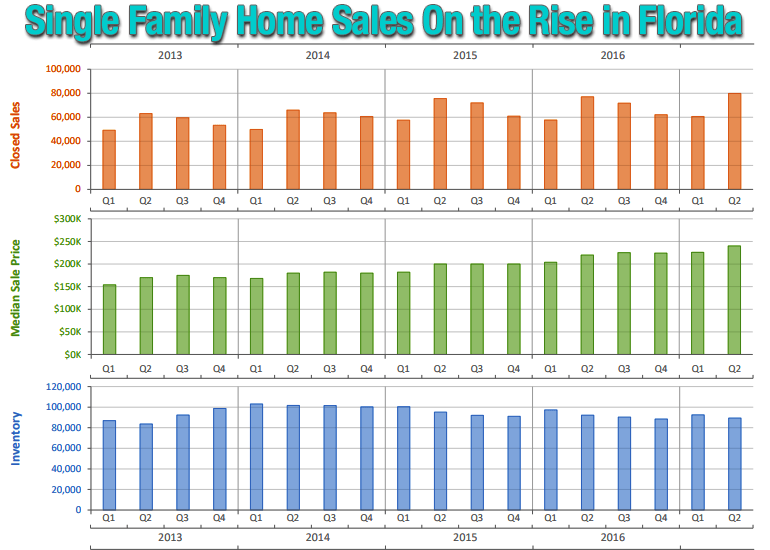 The statewide median sales price for single-family existing homes in 2Q 2017 was $240,000, up 9.1 percent from the same time a year ago, according to data from Florida Realtors Research department in partnership with local Realtor boards/associations. The statewide median price for condo-townhouse properties during the quarter was $175,000, up 7.4 percent over the year-ago figure. The median is the midpoint; half the homes sold for more, half for less. Looking at Florida's condo-townhouse market, statewide closed sales totaled 32,827 during 2Q 2017, up 3 percent compared to 2Q 2016. The closed sales data reflected rising traditional sales – and fewer short sales – over the three-month period: Traditional sales for condo-townhouse properties rose 7.7 percent while single-family home traditional sales increased 9.8 percent. Closed sales typically occur 30 to 90 days after sales contracts are written. 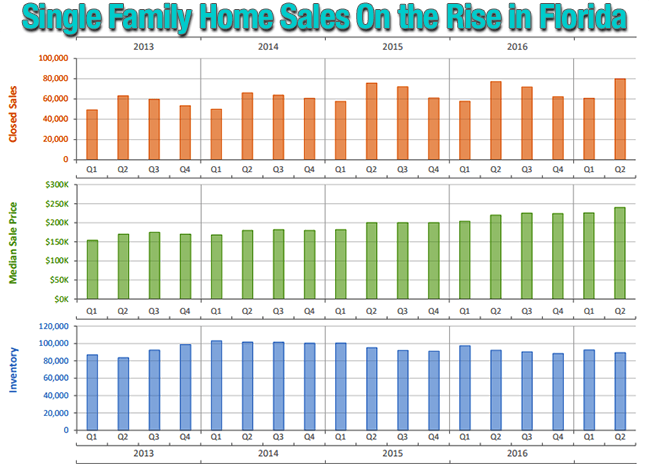 "We continue to see a tale of two markets in Florida," said Florida Realtors Chief Economist Dr. Brad O'Connor. "Homes on the more affordable end of the spectrum remain squarely in sellers' market territory, and the sale prices we're seeing for these homes continue to rise at a faster rate than we're seeing in other segments of the housing market. "The market for higher-end homes, comparatively, is ripe for the picking by potential homebuyers. Home values in this range are generally on the rise as well, but at a more traditional pace. From a value perspective, the biggest winners in the housing market right now might be homeowners looking to trade in their starter homes for something more substantial, given the shrinking price differential between these housing tiers." In 2Q 2017, the median time to a contract (the midpoint of the number of days it took for a property to receive a sales contract during that time) was 39 days for single-family homes and 50 days for condo-townhouse properties. Inventory was at a 3.9-months' supply in the second quarter for single-family homes and at a 5.8-months' supply for condo-townhouse properties, according to Florida Realtors. Florida Realtors® serves as the voice for real estate in Florida. It provides programs, services, continuing education, research and legislative representation to its 165,000 members in 54 boards/associations. Florida Realtors® Media Center website is available at http://media.floridarealtors.org.